Assembling our review model of the Active 120 was a doddle as the machine is almost completely pre-built in the box (folded flat). It’s just a few bolts to secure the uprights into place that’s pretty much it. 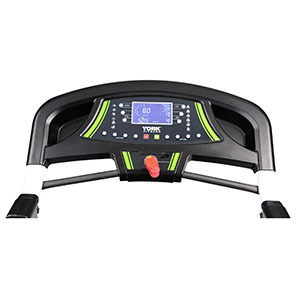 The running belt is a reasonable size for a compact form factor treadmill, measuring 41cm in width and 120cm in length. Before trying the machine, we were a little concerned by the motor rating of 1.25 HP. However, this is the continuous duty rating and it has a peak output of 2.5 HP. When using it, the motor had more than ample power to run the belt all the way up to to the top speed – though running at 10mph on a treadmill of this size isn’t something we’d recommend. The deck feels nicely cushioned, without being too soft, although the 12 levels of incline represent in reality only about 7-8% actual incline. 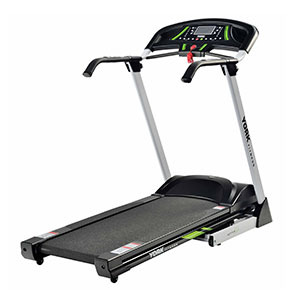 This is important to note as most people buying a compact sized treadmill such as this will be using it for general fitness and weight loss and jogging at an incline burns more calories than running on a flat surface. In terms of ease of use and controls, this machine is good. In manual mode, you simply set the speed and desired incline by using the buttons on the console (which also include 4 speed and 4 incline shortcut keys) or alternatively the speed and incline can be adjusted using the controls on the handlebars. The console itself has a simple and logical layout. At its center is a clear, blue back-lit that provides all the necessary exercise feedback such as speed, incline, calorie consumption and exercise time. In terms of programmes, there’s a selection of 12 programs and the profiles of each is printed on the console itself – making it simple to select the desired one. The programmes control both the speed and incline of the treadmill and each one can have its duration set between 5 minutes and an hour and a half. Heart rate measurement is possible using the pulse grip sensors on the handlebars and the same sensors are also used to provide a body fat test, which takes your age, gender and weight and height into account to calculate your body fat percentage. As increasing amounts of exercise are carried out, this number should reduce over time and as such, it’s a useful motivational tool. The York Active 120 has a folding deck (with soft-drop) and transport wheels so that it can be moved out of the way when not in use. Finally, in the unlikely event of anything going wrong, the machine is covered by a 1 year warranty. The Active 120 is a decent enough machine from York Fitness. It covers all of the basics, but there's better value to be had on the market in the world of compact treadmills. For example, there's the Viavito LunaRun with its almost miniature folded dimensions of just 25cm x 70cm (9.8” x 27.5”). The LunaRun has a larger running deck and features not found on the Active 120 such as user profiles, speakers, tablet holder and a years additional warranty cover - plus it is in the same price range!